This paper outlines the Joint Information Systems Committee (JISC) funded Virtual Seminars for Teaching Literature project (1). It discusses the reasoning behind the project in terms of its pedagogic aims, and shows how the design of the four tutorials varied accordingly to meet them. It is perhaps surprising that this publication, which focuses on European literature and culture, should include an article on a project devoted to a purely anglo-centric collection of literary works, and to a time when Europe was in turmoil and the word culture had entirely different connotations. Nevertheless, having said that, it is hoped that the pedagogic issues discussed below will be of interest to teachers of literature in all languages. Lessons learned when using C&IT in teaching will often inform across traditional subject boundaries. The Virtual Seminars project is funded as part of the JISC Technologies Application Programme which has run in the UK from October 1996. The aim of the Programme is to demonstrate effective use of existing technology in traditional teaching situations: that is, applying it where appropriate, rather than developing new applications. With this in mind, the Virtual Seminars project set out to deliver a series of products which target the teaching of literature. Based on the idea that it is better to provide examples of the technology which is actually being used, rather than simply discussing the technology in the abstract, the primary deliverable has been four online tutorials to teach the poetry of the First World War. However, in addition to these (which are fully outlined below) the project is also producing a digital multimedia archive of source material for lecturers and students to draw upon for their own purposes (2), creating their own online lectures, reading lists, essays, and so on. As noted above, the central topic covered in the tutorials is the poetry of World War I, but in particular the focus is on the work of the British writers of the Western Front. The tutorials are segmented into four parts, but there is no particular sequential order to them, with the exception that students who are new to the area may wish to look at the first, introductory seminar. The four seminars attempt to present an overview of the literature of this genre, and at the same time to introduce academics to ways in which technology can enhance traditional teaching methods. Most importantly, they are not designed to replace a course or teaching time, but to supplement an existing course, providing students and staff with new, freely accessible resources. However, it should not be forgotten that because the tutorials are available from the Web, they also provide a learning environment for those who are not in a position to take a course on World War I poetry, therefore making them of interest to the swelling numbers of lifelong learners. The material presented is primarily aimed at the higher education market, but by its very nature, students at other levels such as in secondary or further education can also use the material, selecting each tutorial as befits their learning needs. In the same way that students of theology and literature debate the difference between a sermon and a homily, it seems appropriate at this point to try and pin down the terms tutorial and seminar. Outside Oxbridge, the pressures on staff-student contact time have more or less driven the tutorial consisting of two or three students into extinction. Those brave institutions that still retain the concept of a tutorial are often dealing with groups of twenty to thirty students at a time, numbers which only a few years ago would have been termed a seminar. In short, in most cases the terms seminar and tutorial are used synonymously, implying a smallish group of students gathering together to focus on some topic or task, allowing for more interaction with the member of staff, and requiring student participation. This definition informs the web-based learning environments created by this project. They are aimed at focusing the students attention on a particular topic, or task, yet at the same time bringing them into contact with other users asynchronously, and possibly, given the right teaching conditions, such as a classroom with a cluster of machines, synchronously. In this article then, the terms tutorial and seminar are interchangeable. 1) Technology should not be used to replace teachers or teaching. Technology should be used as a supplement to teaching, or as a replacement for the absence of teaching by making material available if a course is not currently being taught, or for remote or life-long learners who do not enjoy the privileges of being linked to an educational institution (3). 2) In a similar vein to the theory of Second Best in Welfare Economics, technology should only be used where a noticeable gain to the teaching quality is evident. Bearing in mind the considerable costs of developing IT resources in terms of money and time, it is not enough to simply employ IT on the basis that it will not 'do any harm'. 3) Technology should be applied in appropriate stages. It is not essential to use every bit of new technology at your disposal. Sometimes the most noticeable effects can be derived from very easy-to-use methods, most noticeably in the area of computer-mediated communication (4). As noted above, there are four tutorials. 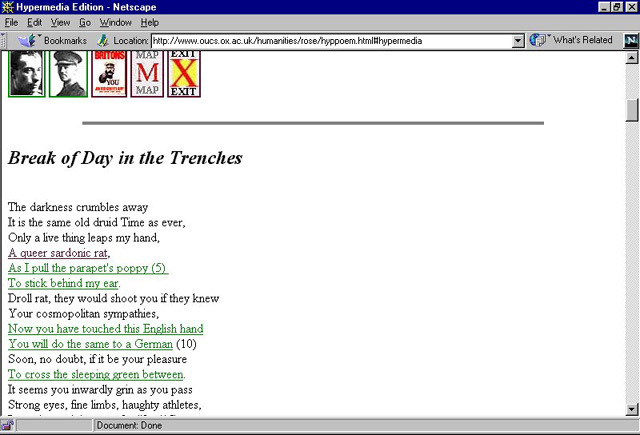 Three of the tutorials went live on the 1st October 1997, but Tutorial II, centring on Isaac Rosenbergs poem Break of Day in the Trenches, appeared on the Web as early as January 1995. To help teachers use these resources in their own classes the project makes a point of providing some guidelines to the tutorials, described as Lecturers Notes, addressing issues such as the level of computer-literacy one should expect from students before they use the tutorials. Further Reading: Here teachers may wish to simply add the URL of the tutorials to a standard reading list and direct students towards them in their spare time. Lecturing Aids: Bearing in mind the graphical content of many of the tutorials, in institutions which have the appropriate facilities (e.g. a lecture room with a computer, internet connection, and projection unit) they could be used as replacements for standard acetates. Course Supplements: Here again students could be directed to the tutorials in their spare time but with them linked more specifically to a lecture or seminar: e.g. Tutorial I would follow-on from an Introductory lecture; Tutorial II after a class on a close reading of a poem; Tutorial III after a class on primary source material or editions; Tutorial IV after a class on Owens (or another poets) style and use of themes/vocabulary. Integral Parts: Here one could actually use the tutorials in the classroom allowing students to access the site on an individual basis (or in small groups) and to round up each class with some discussion time. It is estimated that each tutorial will occupy around 60-90 minutes of teaching time. Having consulted this document, the lecturer should then be armed with enough information to help them use the tutorials in their teaching; the guidelines are thus a very important part of the project. As mentioned above, each tutorial covers a different topic, employs varying levels of technology, and as a result uses a different design. The following outline these various levels in relation to each tutorial in turn. 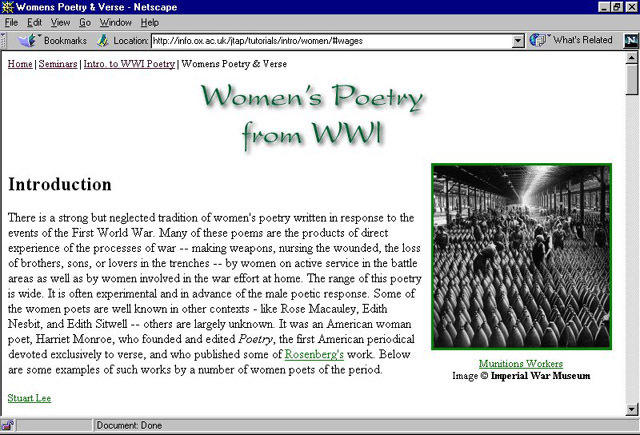 The aim of this tutorial was two-fold: firstly to introduce the subject of the poetry of the First World War and a handful of the major poets, and secondly to provide a gentle introduction to using the Web as a medium for teaching. As well as an introduction to the seminar, which poses interesting questions about the nature and historical validity of War poetry, the user can access pages on Owen, Sassoon, Rosenberg, Thomas, Brooke, Women Poets, and Trench Poetry and Songs. Each individual section contains a biography of the poet (with limited linking to further information), a poem annotated to explanatory notes for selected lines, and a few un-annotated texts. The overall design is simple but effective. Navigational aids and a site plan are provided to help new users, but above all the hypertext is simple and limited. Fig. 1. Tutorial I has a basic hypertext structure which has a dual role in introducing a student to the concept of hypertext, and to the Poetry of WWI. What is the purpose of the hypertext in this tutorial? Despite claims to the contrary by some theorists, hypertext is neither new or innovative. In nearly all cases where it is used in teaching it is simply providing links for the student to follow, guiding them to other explanatory information or supplementary material. In other words, exactly the type of thing good teachers have been doing in classrooms for centuries, or an imitation of the function of notes in good teaching texts (for example The Arden Shakespeare). The area where the technology adds to the teaching is not in the hypertext, but in the provision of a virtual space to discuss the poems. Using a web-based bulletin board (a free piece of software akin to Lotuss Domino Notes) the user can post their own comments, see previous threaded discussions, personalize their display, and search archives of messages. In addition they can be notified by email when someone replies to their messages, or have a digest of messages sent to them. For a study of how useful computer-mediated communication can be to teachers see Stephens, (1997). Fig. 2. The web-based Bulletin Board is regularly used for discussion by readers all over the world. In this tutorial the students are asked to present a close reading of Isaac Rosenbergs poem. 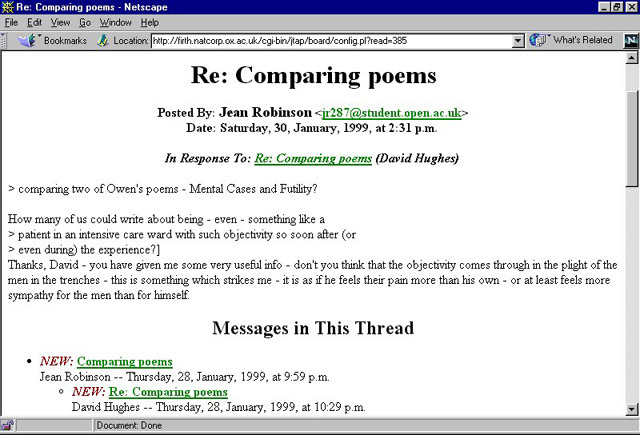 They initially get access to a simple text version of the poem and are asked to provide their comments via a web form. They are then allowed to explore a much larger hypertext arena giving further details on the poem, other poets, the War itself, and extended details of Rosenbergs life. Once they have finished they are presented with the poem again and asked to record their observations having now discovered its social and historical context. In addition they can see the comments of other users of the tutorial, drawn from an extensive archive which has been built up since 1995. The design of this tutorial is important because it is essentially circular, bringing the user back to the poem at the end, but also because the site is closed; that is, there are no links to external sites. In this way, it is possible to control the user's browsing and make sure that all users are exposed to the same material. The hypertext is more complicated than in Tutorial I; indeed the site overall is much larger and, although the HTML is limited by the fact that the pages were constructed over three years ago, the technology still adds to the users experience by presenting an extensive archive of comments by others for them to study. Fig. 3. 'The Break of Day in the Trenches' tutorial contains a wealth of multimedia material which surrounds the poem and informs its reading. This section represents a move away from traditional teaching of modern literature. Although in other areas, notably in medieval literature, students are often introduced to primary source material and are directed to manuscript variants, this has often been difficult with more recent texts. This is due to a variety of reasons such as: finalised texts being published within the authors lifetime, copyright, lack of facsimile editions of manuscripts, and so on. In Tutorial III the students are given access to digital facsimiles of the four manuscripts containing Owens poem Dulce et Decorum est (which he never saw in print) and are instructed to produce their own edition. The technology allows students to see these rare documents, and to lay them side-by-side, albeit virtually. In reality two of the manuscripts reside in Oxford, and the other two in the British Library, so this is never possible with the original documents. After studying the facsimiles the students are prompted to select a base manuscript. Using web-frames they can then collate a transcription of their chosen extant version against the other witnesses, recording variants in the standard tradition of scholarly editions. Thereafter they are able to email their own edition to themselves or to their teachers email account. Fig. 4. Tutorial III. The student uses a text version of their chosen base manuscript against which to collate the manuscript variants. The final edition can then be emailed to the student and their teacher. The design of this tutorial is different to the first two tutorials. It is possible (though perhaps fanciful) to liken Tutorials I and II to a medieval quest, with the user embarking on their adventure from a given point, exploring various routes, but eventually returning to their starting location, more experienced and perhaps more enquiring than they were when they set out. With Tutorial III and Tutorial IV, instead of plunging into the hypertext environment the progress is much more linear. To continue the medieval analogy it is much more akin to a pilgrimage, taking the user through a series of steps in order to reach understanding, attain a skill, or, as in this case, create their edition. It is the belief of this author that when attempting to teach skills, such as basic editing, students should be guided along a straight path gaining knowledge which they build upon as they progress. This tutorial has been used within undergraduate teaching in an English course at the University of Kingston. The lecturer, Colleen McKenna, has claimed that it proved very successful, most notably in making the students aware of the life of a poem in terms of the authors drafts, rewritings, and attempts to find the right words or turn of phrase. Some students chose to select the edition creation tutorial as their assessed assignment for the course; they talk of a better empathy with Owens poetical style, seeing his struggles with vocabulary, and glimpsing the efforts involved in the creative process of poetry, something which is often obscured by printed editions. Fig. 5. Tutorial IV includes guided instruction to the use of the text analsyis system with examples of themes explored in traditional literary criticism. With this Tutorial the most important points to note are, firstly, as already mentioned, that it was recognised that there was a strong need to guide students to applied examples of text analysis, (that is, not to simply let them put in any term that came into their heads); and secondly, there was the need to use the latest edition of the poems and not to fall into the easy trap of using out of copyright editions which more often than not are scholarly inaccurate. The second major deliverable of this project has been the collection and free provision of a multimedia digital archive of primary source material. The rationale behind this development is fairly straightforward, although the technical implementation of most of it has proved difficult. I hope it is clear that the tutorials outlined above will be of use to many academics who are teaching Great War poetry, and even for those who are not, they may provide examples of design and of the use of technology, and so on. However, although many warm to the convenience of off-the-shelf tutorials, most academics would prefer to have greater input into the content and design of their own course materials. These are the requirements that the digital archive aims to satisfy. Here the lecturer or student is presented with a searchable, and browsable collection of carefully selected primary source material: 600 manuscript images, 500 photographs, 100 audio tracks, 50 video clips. 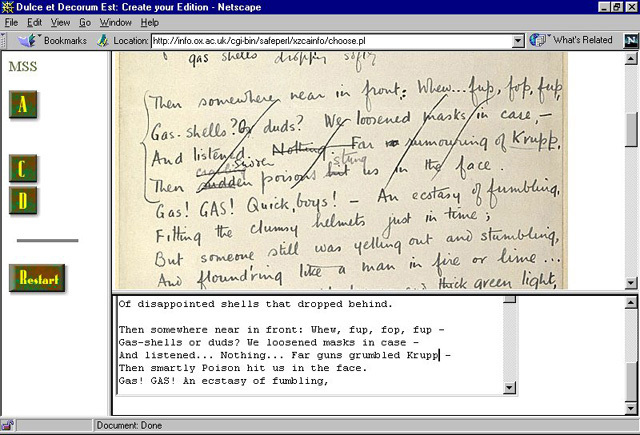 These can be used in the student's own coursework, or, by using a tool developed by Chris Stephens called the Path Creation Scheme, the student or teacher can create annotated trails through the archive for others to follow. The collection strategy of the archive is important because it brings in material which would normally be used in teaching the history of the War, but instead makes it available with a literary focus. The collection includes interviews with veterans from the War, photographs of the battlefields then and now, and extracts from films released in 1916 which illustrate the conditions on the Western Front. In a similar vein to the second tutorial on Rosenberg, this brings history to the literary student and, we hope, literature to the historian. In 1916 the British High Command launched its offensive on the River Somme. At the height of the conflict, when it was clear that objectives were not being met but that the slaughter was reaching calamitous proportions, the General Staff turned to technology in an attempt to solve their solutions in the form of the new secret weapon, the tank. It was spectacularly unsuccessful. The reasons for its failure lay in poor untested technology, unrealistic goals, inappropriate use of the technology (notably on account of the prevailing weather conditions), insufficient resources, insufficient training, and poor support. In essence then, a close match of the list of the problems that currently beset the use of educational technology. It is hoped that the Virtual Seminars project has taken these issues into account, and provides examples of how some of these can be overcome. The Project received £50,000 in total and completed in October 1998. The Project Manager was Stuart Lee and the Project Officer was Paul Groves. In addition, it would be amiss of this article not to acknowledge several individuals and institutions who have contributed to the projects success. These include the projects steering group, the Imperial War Museum, the Harry Ransom Research Centre at the University of Texas (Austin), and the Hulme University Fund (Oxford) who generously contributed £6,000 towards digitization costs. Needless to say the author strongly disagrees with the views expressed by Margaret Hodge, MP, of the Commons Education Select Committee who, in reports dated 21/5/98, suggested that if pupils are working from lessons on the Internet, a trained classroom assistant may be as useful as a teacher and that information technology could lead to a need for less teachers. To this end the reader is directed to Groves, Lee, and Stephens (1997). In abstract, the main argument in this is that a teacher can use technology at different levels of complexity and virtuality, without losing any of its effectiveness. For example, the virtual-lite scenario of the report consists purely of the use of e-mail and discussion lists to increase class communication. This is extremely easy to implement, but at the same time has noticeable and well-documented successes. For the technically adept, the base texts, encoded in SGML (Standard Generalized Markup Language), were drawn from the holdings of the Oxford Text Archive. A certain amount of tidying-up was needed to get them to conform to the Text Encoding Initiatives TEI Lite DTD but this was not too arduous. 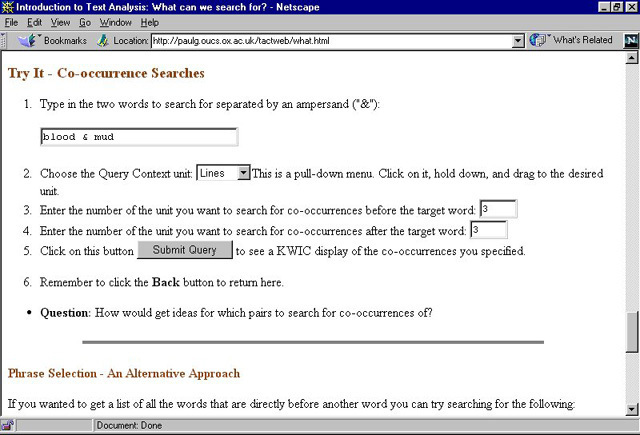 They were then filtered into TACTWeb and a web-based interface to the texts was designed. Groves, P., Lee, S. and Stephens, C. Existing Tools and Projects for Online Teaching. JTAP Report. (Oxford: University of Oxford, 1997). <http://info.ox.ac.uk/jtap/reports/teaching/>. Stallworthy, J. (ed). The War Poems of Wilfred Owen. (London: Chatto & Windus, 1994). Stephens, C. Email lists - Virtual Lite in Groves, P., Lee, S. and Stephens, C. Existing Tools and Projects for Online Teaching. JTAP Report. (Oxford: University of Oxford, 1997). <http://info.ox.ac.uk/jtap/reports/teaching/>. Not to be republished in any form without the author's prior permission.